Just thought I would drop you a quick note to let you know that I have fired up the 3 TH11DXS beams with your stackmatch and it seems to be working great. In our telephone conversation you thought that having the antennas at 60', 120' and 180' might not work very well due to the large separation and height of the top antenna but it seems to perform just as I had expected. Local stations vary in strength depending on conditions and the combinations of the beams, some times improving the signal and sometimes degrading it. At times a single antenna is better than any combination. However, when working dx, such as Europe, as a rule, combining the 3 beams gives me about 5 - 6 dB of gain over any single antenna. I have tried it with a number of different stations on different occasions and the results were the same each time. It seems that whatever I notice on the receive end, is what is experienced on the other end. Thirty nine countries and all continents in one week with mostly S9+ signal reports. 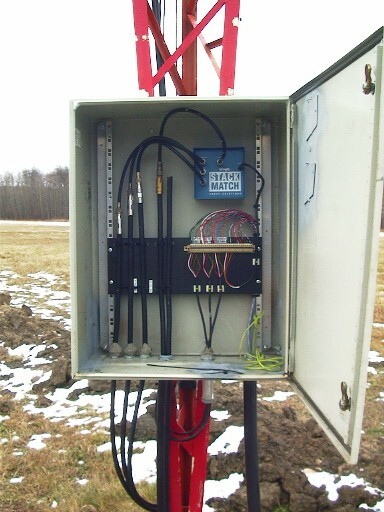 Will be ordering a Stackmaster for the 40 meter beams this spring.